The Ryder Waite Tarot deck was conceived by Arthur Edward Waite and illustrated by Pamela Coleman. The deck has 78 cards which consists of 22 Major Arcana cards and 56 Minor Arcana cards. Arcana means "secret", so what we have are 22 major secrets and 56 minor secrets. The 22 Major Arcana cards demonstrate the order of growth and development in any entity. These are the major events in the development of the soul. The theme of each of these cards is explained in the page "Path Themes" under the Numerology heading. Further explanation of the relationships between these cards is provided in the pages Comfort Relationships, Reciprocal Paths and Reflex Associations. 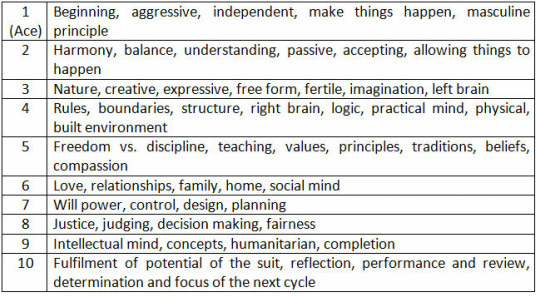 The document below provides keyword meanings for the 22 Major Arcana Tarot cards. In and around these major events are the ordinary, more mundane episodes of life. These are demonstrated by the Minor Arcana cards. The Court cards can be defined in various ways. Each of them can relate to an actual person, a particular gender and stage of development. They can also refer to stages of growth and development within our self. This explains how the Court card, associated with a clearly female entity, can be identified as the "King". Pages may be seen as conceptual entities at the very beginning of a life, a project or an event. Knights are the next stage of development after conception. They represent an active mind, keen to create and get on with life, the project or the event. Queens represent the need to nurture and emotionally carry the ongoing development. Kings are the fulfillment and embodiment of the life, project, or event - the manifestation and the material body. Apart from these stages of development, the Page is a young female, the Knight is a young male, the Queen is an adult female and the King is an adult male. Another way of looking at them is that the Page is an infant (male or female), the Knight is an adolescent (male or female), the Queen is an adult female, and the King is an adult male. It is confusing but thinking of people in these various ways can help to understand them better. Carl Jung in his psychology refers to the anima and animus. Jung claims that within every female person there is an internal male aspect, and within every male person there is an internal female aspect. We are all made up of these two parts and our journey is striving to find a balance and harmony between these conflicting aspects or dualities. When we achieve this state of balance and harmony, Jung calls this Individuation. We are made up of passions, emotions, ways of thinking and bodily development which are all at different stages of development. As we progress on the Soul's journey, we are seeking to mature all of these aspects and bring them together, as a mature human and a mature soul. 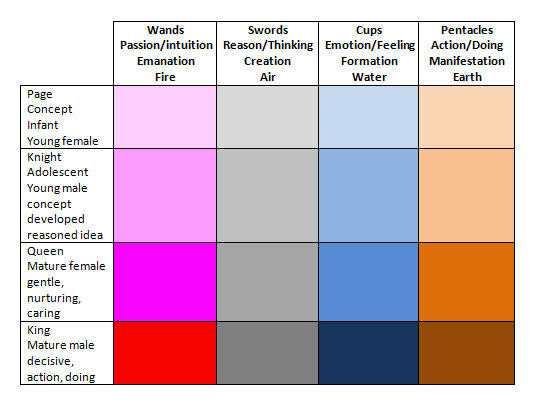 The chart below shows how the meaning of the suits are applied to the various Court cards. To use the chart cross reference the column and the row. For instance the Page of Pentacles relates to Concepts, may be an infant or a young female related to action/doing, manifestation and the earth.